I must have been to Bali over ten times. It is possibly the most popular destination in Southeast Asia and pretty much everyone I know in Singapore comes to the Island of Gods regularly. It is accessible, flights are affordable and there is literally something for everyone. Far from being just a party island, Bali has grown up and graduated. It offers great surf, beautiful beaches, jungle and rice paddies, delicious food, great beach clubs and a thriving start-up community attracted to the good internet connectivity, a developed ecosystem and warm weather all year round. The hospitality world is one of the most developed and competitive. From stunning villas to high-end luxury boutique resort the hardest part is to chose where to stay. Precisely because of this, of all the times I have visited I never considered booking at any of the large hotel chains, with the exception of the funky, newly opened at the time, W Hotel. 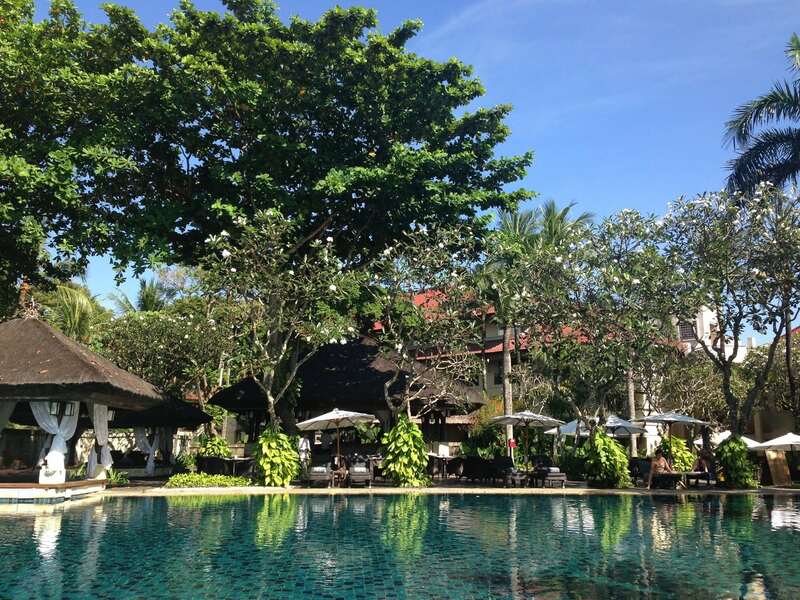 There are so many smaller and over the top options such as the Bulgari Hotel or the Aman Resorts in Ubud and Nusa Dua that a soul-less mass-market chain seemed like a lazy opportunity lost. In the case of the Intercontinental Resort, I was wrong. The Resort wowed me with fabulously personalized service, beautiful facilities, lush well-manicured grounds and deliciously fresh food. Did I mention the beach was very pretty too? There you go. Read on for the low-down. On this occasion I went to for an easy and affordable weekend stay with the objective of visiting some of the wineries. Accommodation was secondary to location and price so we were initially booked at the Holiday Inn Resort. Upon arrival, past midnight on a Friday, they told us that our room, “Had a problem”. I was internally fuming as the wonderful Hotel Manager continued on to explain that we were given the option to move to the Intercontinental. 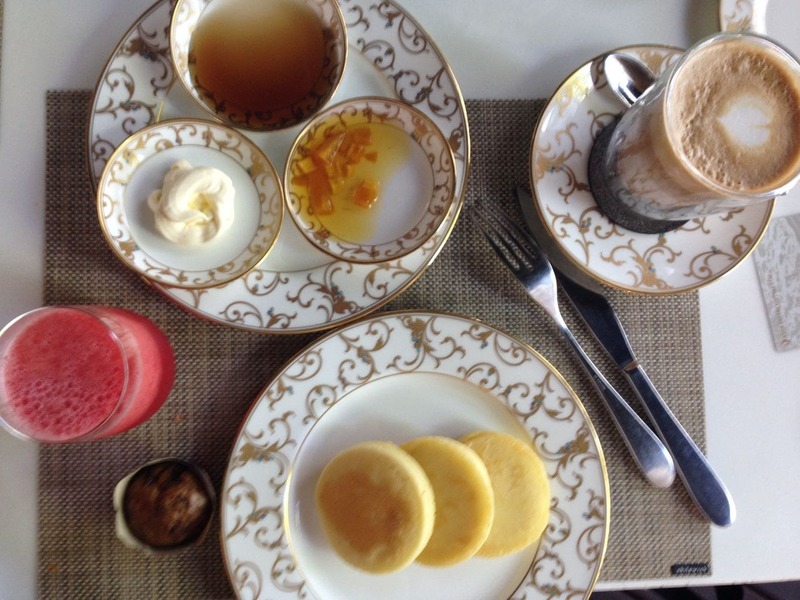 I swallowed my disapproval and the speech I had been rehearsing in my mind as he slowly described the issue with the AC and tried to hide my excitement at the idea of upgrading to the Intercontinental, for free. I was sure this was not just good customer service but also directly linked to my Ambassador Platinum level with IHG and I sincerely felt appreciated. In fact, both me and my friend Marisa who was coming to Bali with me for the weekend, could hardly hide our ear-to-ear grins. The great service did not end there. They had a driver awaiting to take us to the Intercontinental and the Hotel Manager came all the way with us to ensure there were no issues at check-in. Arriving at the Resort was fabulous. The grand entrance, the fountains, the lion statues. At night, with the lights, it felt even grander. We were exhausted but pleased. We completed the check-in formalities and were advised of the various other benefits we had been granted including free breakfast, tea and drinks at the Club Lounge, free-flow happy hour drinks afrom 4,30pm to 7,30pm at any of the bars, including the beach bar, a double upgrade to a suite in the Club Wing and access to the private Club Pool, where children below the age of 12 were not allowed. We also received a free dinner for the inconvenience caused. I had completely forgotten about any inconvenience. Since this was an Intercontinental property rather than a Holiday Inn, my Ambassador membership also kicked in so we got a free photo session on the hotel grounds as a local gift included as an Ambassador privilege. After a refreshing welcome drink, the concierge walked us to the room showing us around the hotel on the way and explaining the facilities. The resort is large with various wings and several restaurants so we strolled for about 5 minutes before we reached our room. By the time we got there out luggage was already waiting. After a quick tour of our wonderful room we were left to enjoy our stay. The suite was large and had two queen sized beds and a third chaisse longue which had been converted into a third bed as we were initially going to be three guests. On the following day they returned it to its original state. There was also a balcony with two sunbeds to relax. Apart from the bathroom with a shower and soaking bath there was also a convenient dressing room with an additional mirror and sink, very useful when you are sharing the room with someone so you can get ready while the other person is showering. There was a large TV and a well-stocked minibar. I cannot think of anything missing from the room. We had two types of bath ropes, one for coming out of the shower and another one, thinner, to walk around the room. The sleepers looked comfortable too. I loved the amenities provided. Not only were they from famous Thai brand, Hann, but were also packaged into 100ml pump bottles and replenished throughout our stay. Needless to say we took home whatever was left, such convenient bottle for when you are traveling. They smelled beautifully too. As part of the Platinum and Ambassador levels, They had also placed a bowl with fresh fruit, a few bottles of water in a glass bottle scattered around the room, a Nespresso machine and tea bags. There is an in-house spa that was undergoing renovation but still open. Every time we walked past it the beautiful smell of lemongrass filled the air. The best feature of the hotel were its sprawling lawns and green grass. 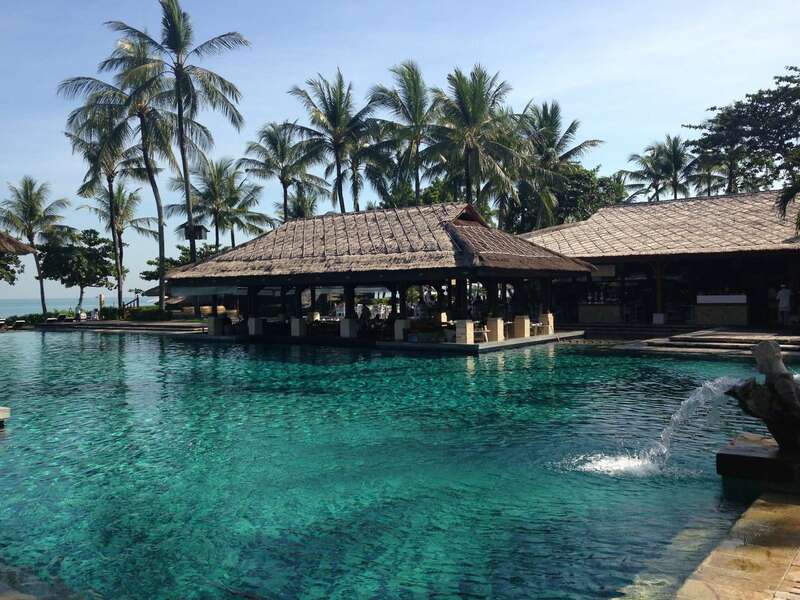 The entire property was in front of the sea, on premium real state facing Jimbaran Beach. All the gardens, and palm trees were well taken care of. The Lion statues that flanked the bridges and fountains were decorated with fresh flowers, the ylang ylang trees were in bloom. The beach is easily accessed through the various openings on the bushes. 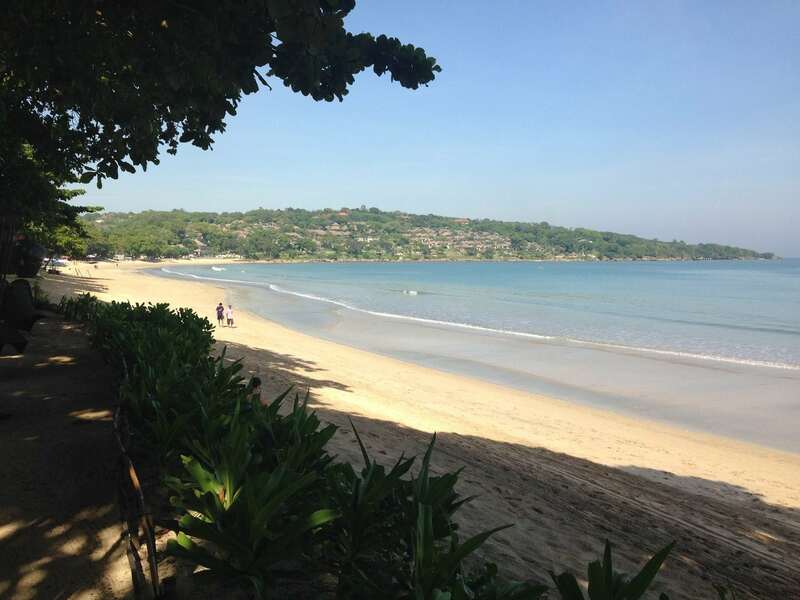 Since beaches in Bali are public there were no hotel sun beds or facilities on the sand but you could lay within the hotel’s grounds and still dip your toes into the sand. 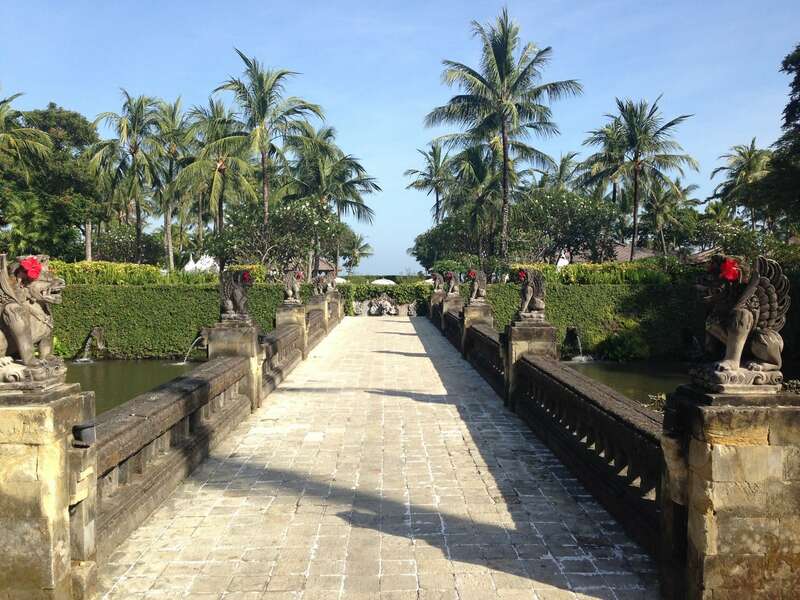 Aside from the gardens, there were a few water features, a fountain spitting water and six pools: two fun pools for kids, a Balinese Bath pool, the main pool, a fountain pool and the Club Pool. 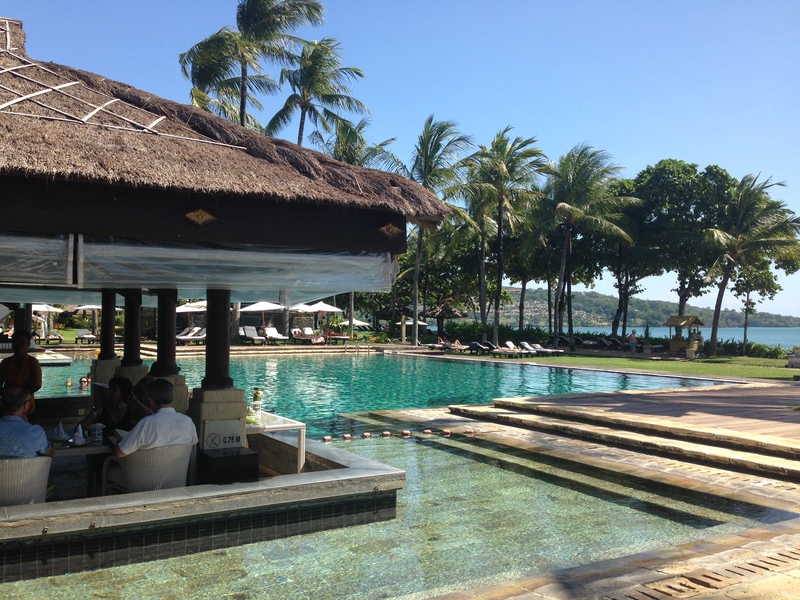 The main pool had a swim up bar and was surrounded by the main lunch restaurant, only a few steps from the beach. For the freshest coconuts you could approach the most popular bartender: the one manning the picturesque bambo stall selling coconuts and mojitos. What to chose… The coconuts were so paradisiacally presented, opened, on a bambo holder and with a frangipani flower. Not sure guys would agree, but any girl would want to order one. There are a few restaurants to chose from. 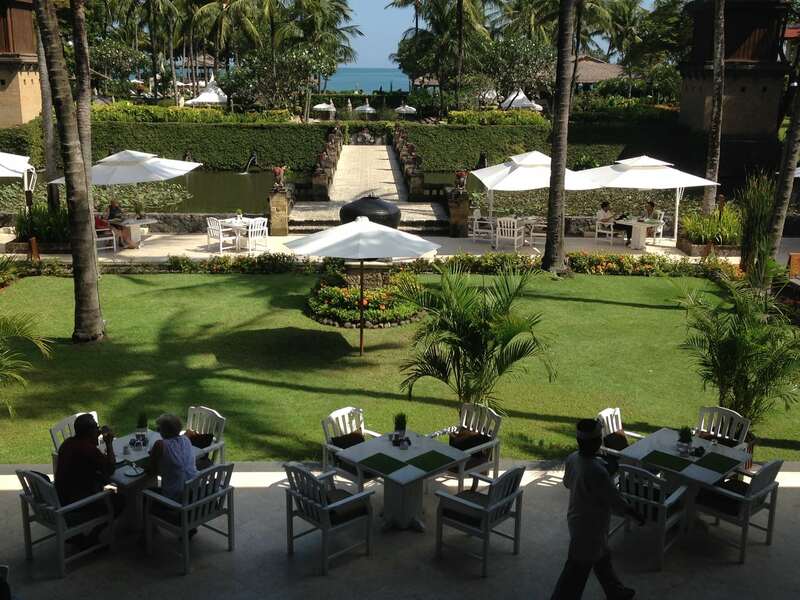 In our weekend stay we only tried Jimbaran Gardens by the pool, the Club Lounge and the Taman Gita Terrace, the main venue for breakfast. At Jimbaran Gardens the menu included an assortment of international palate pleasers and all of the local Indonesian favorites. The setting was open air, with the main building roof and a few umbrellas to protect guests from the lunch time sun. The food was delicious and the service impeccable. Although we had not stepped into the main pool during our entire stay the waiter knew our names. I can only assume this was because of either my status or our room being part of the Club Wing where guests were treated to an even more special level. I was indeed surprised. At Taman Gita the breakfast spread was big enough to satisfy any type of guest. There were the usual international options plus the very common Asian delicacies, so much a staple of the large hotel chains across the continent. Aside from the selection of fresh juices they could also make one to your taste. At the Club Lounge, breakfast, like any other service, was an elegant affaire. The room was pompous, with a colonial look and feel, large chandeliers, golden appliques and plush chairs. Once you walked inside you could be in any big city and the island feel was sadly gone. Stepping in dressed like the beach we felt slightly out of place and, on the occasion when the staff did not recognize us, our outfits made them ask what we were doing there. In a more polite manner of course. Breakfast menu was a la carte and you could order pretty much anything you could think of. Food came beautifully presented and served in exclusive china. The outdoor section was in the shade, by the pond, across from the main restaurant noise. It was pleasant and relaxing, and it did indeed feel exclusive. Aside from food we also perused our Club Lounge benefits, at the Sunset Bar. We had happy hour between 4,30pm and 730pm which could be enjoyed everywhere. I welcomed their approach to this benefit which so often is limited to the Club Lounge only. That would have been a pity at a beach resort. We just had to mention our room and they did not need any more details to honor the benefit. We could order anything from the main drinks menu except for the premium rums. So the evening was spent with a few margaritas and wines. 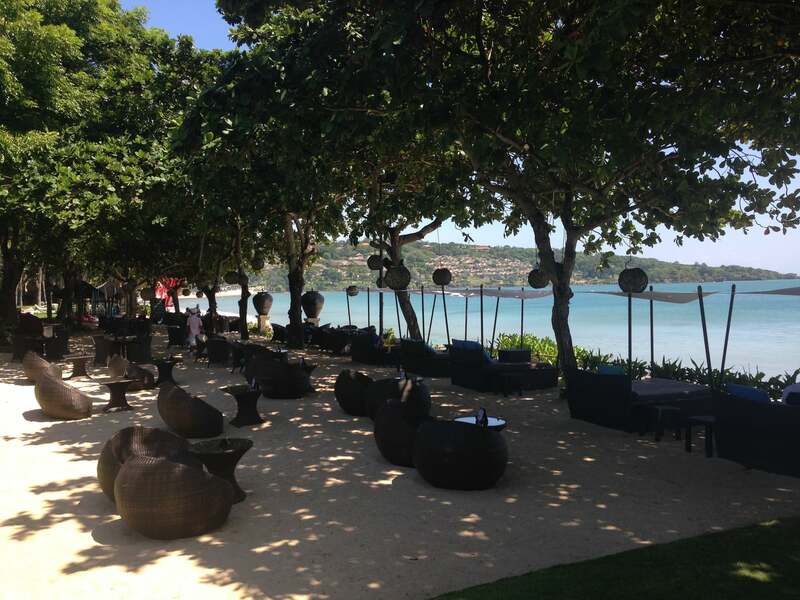 As I have been highlighting all along the service was impeccable and of the standards Bali can be expected to provide. The island has a long history of welcoming tourists and, at the highest end properties, this is clear. The staff were always attentive and the dealings always felt personal despite the size of the hotel. By the Club Pool, service was exquisite. The staff recognized us on the second day. Once we walked in they came straight up to set our sun beds with towels and provide water, free of charge. From then on, every time we needed their services, we just needed to place the small yellow flag. This was a clever way to avoid the not-very-chic waving and calling. The only time when the service was a bit disappointing was at the Sunset bar where we had to call the waiter a few times and even had to walk up to the bar to get served. I suppose it was dark and hard for them to see if someone was trying to get their attention. 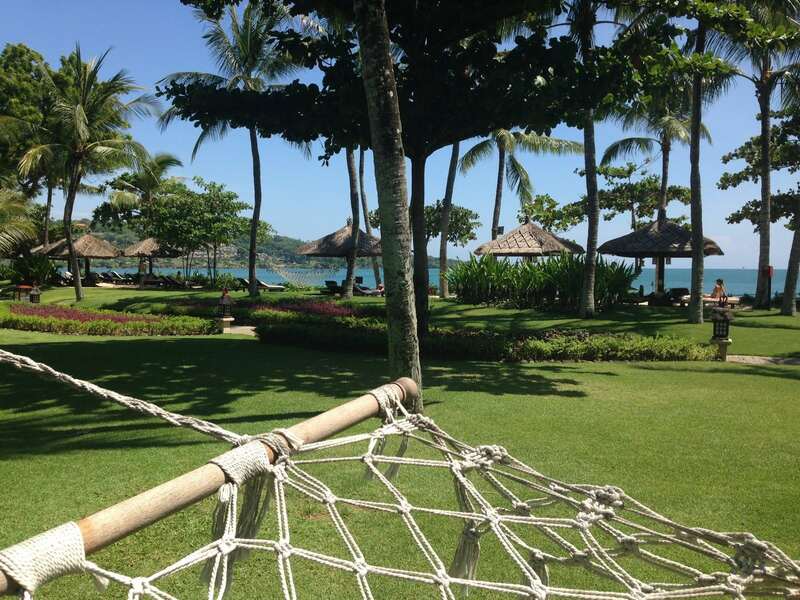 The Intercontinental Resort Bali is a great place to unwind and relax. It is well located in Jimbaran, not too far from Seminyak that evening meals are a trek and not too close to be constantly engulfed in a sea of tourists. Despite its size, it managed to make us feel as if we were in a small property. A great find!